When you turn on the tap for a glass of water, to fill the kettle or to water the garden, do you ever think about where it's come from? The water in many of our rivers is removed and treated for drinking water supply. The water treatment works that clean this water for us are very effective at what they do. But sometimes they need a bit of help along the way...and that’s where I come in. 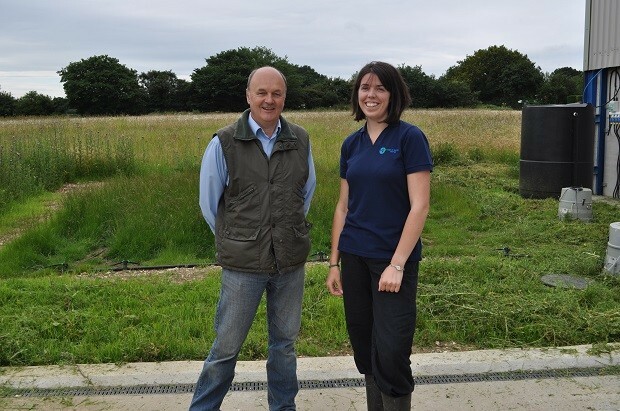 I am a Catchment Advisor for the Chelmer and Blackwater Catchment Partnership in Essex, which means I work with farmers to improve water quality in the catchment. It's a busy job and one that I love. The Chelmer and Blackwater are mainly arable river catchments, covering 1,000km², with 72 miles of river and over 650 farmers. Working with these farmers, along with their crop experts and advisors, is key, with the aim of improving water quality and minimising the opportunities for pesticides, nitrate, phosphate and sediment to enter the rivers. The Chelmer and Blackwater Catchment Partnership is a successful and award-winning partnership between the Environment Agency, Essex and Suffolk Water and Catchment Sensitive Farming (CSF) - a project run by Natural England in partnership with the Environment Agency and Defra. These three organisations joined forces in 2009 with the shared ambition to improve water quality in the catchment. There was a recognition that collaborating to work with farmers to talk through water pollution issues would work best for the farmers and the organisations themselves. Each of the organisations played to their strengths: the Environment Agency wanted to reduce the need for regulation and enforcement, Catchment Sensitive Farming had the knowledge and expertise on reducing diffuse pollution from agriculture, and Essex and Suffolk Water, needed to comply with the EU Drinking Water Standard for pesticides. So, what have we achieved since then? We have taught farmers about accurate slug pellet applications, sampled rivers to see how healthy they are, learnt how to manage cracking clay soils, enabled rainwater harvesting on a large scale through grant schemes, kept cows out of the river with specialist livestock fencing and encouraged many of the farmers to try out new practices– such as improving their sprayer filling area, and using nitrate testing strips. One example of the adoption of a new practice was the construction of a demonstration ‘biobed’ – a natural treatment system for pesticides – on a farm near Hanningfield Reservoir. We held events for farmers to come and have a look themselves. The Environment Agency attended to let farmers know what they needed to do to comply with the legislation. We made a video, which has been watched worldwide from Brazil to Australia, and we provided one-to-one on-farm advice for the design and a 50% grant scheme through CSF. The result? Farmers who had never heard of a biobed or biofilter, who had always filled up in the same spot in their farm yard, have now put in new sprayer filling areas, some with roofs, linked to a biobed, biofilter or a sump tank, and are now protecting nearby drains or ditches from contaminated run-off and pesticide washings from their farm yards – a success of partnership working for our rivers. Working together and involving farmers in valuing water, and providing them with the means to make on-farm improvements and carry out best practice for water quality, has made a difference for our rivers that will be continue to be built upon, in partnership, in the future.